For the full 2013 Hyundai Genesis review, please scroll past the video below. It's our job to furnish Hyundai reviews composed by the most accomplished automotive writers in the business - it's just one of the things that makes us a prominent Hyundai retailer in Dallas. Once you begin to read, you'll find that this article is filled with beneficial features and information. 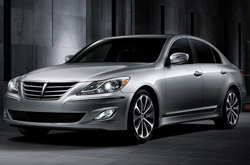 Read on to see if the 2013 Genesis should be parked outside your home. Comparing the 2013 Hyundai Genesis to against vehicles like the 2013 Scion FR-S, Lexus IS 350, Audi A4, BMW 5 Series, Infiniti G37 and the Mercedes Benz E550, and you will realize that the 2013 Genesis ranks above the competition in various areas. Take a look at our bullets to see why! Take a peek inside the 2013 Genesis - view video now! Hyundai Genesis owners won't get the same wonderful factory-trained Hyundai mechanics and actual Hyundai parts at a national service company. But at our Dallas dealership you'll take advantage of this regularly, along with the peace of mind that comes with getting a 12-month service warranty. The skilled technicians at our Hyundai repair branch in Dallas will help your Genesis run strong. We take on a large spectrum of jobs: from more time consuming, time consuming tasks like electronics maintenance to simplistic stuff like front and rear brake pad replacement and snappy multi-point inspections. From the simple to the complex, Van Hyundai can manage it all and offers reasonable prices, superior service and pros mechanics. Take a look below to view money-saving service specials.